Love Cherish Adore - New South Australian wedding magazine lauches! New Inspirational South Australian Wedding Magazine Launches! While planning my own wedding I often flicked through the pages of magazines such as ‘White’ and ‘Hello May’, and although they certainly were full of amazing inspiration, I was often disappointed by the lack of local weddings and vendors featured. Well I am very proud to say that there is a new kid on the block, and it is full to the brim of home grown South Australian talent! Let me introduce you to LOVE CHERISH ADORE. Love Cherish Adore started in 2013 with a series of fun and creative wedding fairs providing a chance for Adelaide Brides and Grooms to connect with the most creative and unique wedding vendors in South Australia. A few years on and the newest addition to the Love Cherish Adore family – a beautiful and unique magazine – has just been launched! With a desire to inspire couples with soulful and love filled inspiration and content, the Love Cherish Adore magazine features local real weddings, styled shoots, up to the minute bridal fashion and so much more. Love Cherish Adore is a wedding magazine with fluid style and substance that I know you’re going to LOVE! The best part is that it is all local, so you can work with the seriously talented people featured throughout to help bring your wedding day dreams to life! 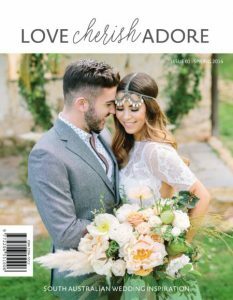 So if you are planning your wedding don’t forget to pick up a copy of Love Cherish Adore at major newsagents, you can also order online HERE or pick up a free copy by attending the next Love Cherish Adore wedding fair on Sunday September 25th at Ayers House.